Among other things, Sharon was frequently the victim of anti-Semitic media coverage, particularly in Europe. The cartoon above is from Spain. * Tom Gross: Ariel Sharon’s long and controversial career – as Israeli general, politician, and builder and then dismantler of settlements (in Sinai, Gaza, and four in the West Bank) – has inspired so much vituperation and calumny that it has often been difficult to separate fact from fiction. * Time magazine was one of many publications to slander Sharon, falsely claiming he ordered the 1982 the Sabra and Shatilla massacre of Muslims by Christians in Beirut. Sharon successfully sued Time. * In the last few minutes BBC Radio News at 4 pm eulogized Sharon by giving the floor as the sole speaker to a Palestinian man who claimed Sharon should not have been allowed to die of natural causes. * Intifada leader Marwan Barghouti (contradicting anti-Sharon Western journalists): “The intifada did not start because of Sharon’s visit to Al-Aqsa”. * A week earlier, El Pais, Spain’s equivalent of The New York Times, published a cartoon of an allegorical figure carrying a small rectangular-shaped black moustache, flying through the air towards Sharon’s upper lip. 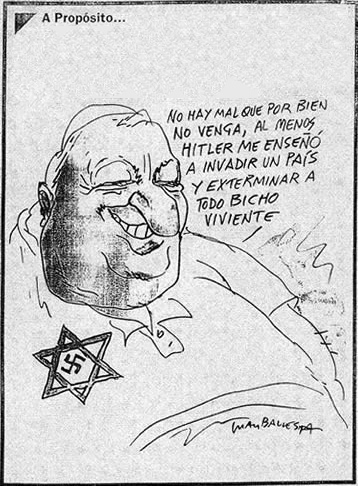 The caption read: “Clio, the muse of history, puts Hitler’s moustache on Ariel Sharon”. * Hundreds of similar anti-Semitic motifs have been applied to Sharon in recent years. The Economist magazine in London compared him to Charles Dickens’s infamous anti-Semitic stereotype, Fagin. * A shorter version of this dispatch appears on National Review Online. * This page has been linked to in several publications, for example by Lee Smith in The Weekly Standard. Former Israeli Prime Minister Ariel Sharon passed away a short time ago at the age of 85. He never recovered from the devastating stroke he suffered eight years ago, on January 4, 2006, five years after being elected prime minister. Already in the last hour, some in the international media have started to vilify him. While he was a complex figure, and (like many western and Middle Eastern leaders, not without some wrongdoing), many of the accounts are grossly unfair. To help counteract some of the defamation, I attach two of my previous articles. The first is a review in The Wall Street Journal of a major biography of Sharon published after he suffered his stroke. The second is a comment piece that appeared in the Jerusalem Post (in English) and Ma’ariv (in Hebrew) on the international media coverage of Sharon shortly after he suffered that stroke. There were over 24,000 articles published on Sharon in the 24 hours following his stroke. References to him as the butcher, the bulldozer, the war criminal, and the “successor of Hitler,” were considerably fewer than in the past. Still, The Guardian didn’t hail him as “a modern Moses,” as they did about Yasser Arafat on the front page of the newspaper when he died. Compared to Egyptian-born Arafat, Sharon (who was born in pre-state Israel) came from a humble background: his mother tied strips of leather around her feet as she farmed swampland because she didn’t want to ruin her only pair of shoes. Prior to that, Sharon played a key role in IDF victories in the Sinai desert in both the 1967 Six Day War and in the 1973 Yom Kippur War. One of the best-known photos of him is the image of Sharon in an IDF uniform with a white bandage wrapped around his wounded forehead. He was also a very important figure in Israeli politics, helping to found two parties that went on to government, Likud and Kadima, and helping to build settlements (when he saw them as vital to Israel’s security) and then dismantling them when he saw them as a liability to Israel’s security. Sharon had made clear that he preferred to be buried at his Negev ranch – next to his late beloved wife Lily – rather than in the traditional cemetery for former Israeli prime ministers on Mount Herzl in the capital Jerusalem. EVEN now, as he lies in a stroke-induced coma from which he is not expected to recover, the vilification of Ariel Sharon continues. Last month, for example, one of Britain’s leading magazines, The New Statesman, in the course of attacking Tony Blair for supporting the “racist regime in Tel Aviv,” attributed to Mr. Sharon a series of racist remarks about Arabs. But Mr. Sharon had never said them. They were the words of extremists that he had specifically repudiated. It was the equivalent of taking the words of the Ku Klux Klan and putting them in the mouth of George W. Bush. The New Statesmen eventually printed a letter noting its error, but without offering an apology or official correction. Mr. Sharon’s long and controversial career – as Israeli general, politician and peacemaker – has inspired so much vituperation and calumny that it has often been difficult, especially for observers outside Israel, to separate fact from fiction. Thus “Ariel Sharon: A Life” is especially welcome. While the authors, Israeli journalists Nir Hefez and Gadi Bloom, clearly hold their subject in high esteem, their tone is far from merely adulatory. They do not shy away from the misdeeds and excesses of which Sharon has often been accused. But they seem intent, most of all, on faithfully describing the full arc of his crowded life. Mr. Sharon’s supporters have long hailed his tough approach to terrorism and viewed him as a leader who strived to establish peace without sacrificing Israel’s security. His detractors claim that he overstepped the mark and caused unnecessary civilian suffering. All agree that he has played a pivotal role in almost every major event in modern Israeli history, and even his worst enemies acknowledge that he has shown extraordinary courage, both in battle and in politics. Inevitably, “Ariel Sharon: A Life” is dense with facts and incident, but it is a lucid read, well translated from the Hebrew by Mitch Ginsburg. The book appeared in Israel last year; the English edition has been updated to provide a full account of Israel’s withdrawal from Gaza. Mr. Sharon spearheaded for the Gaza move in 2004 and 2005, which spurred the formation of a new political party under his leadership. Kadima, as it is called, won the Israeli election in March of this year, even after Mr. Sharon’s stroke, largely on the basis of his popularity. For all his political mastery, Sharon may ultimately be best remembered as a military man. He fought in all of Israel’s wars or played a major role in leading them. Time and again soldiers who served with him testified to his resilience and resourcefulness. He was also a master tactician. His assault on Abu Agelia fortress during the 1967 Six Day War is still studied in military academies around the world. 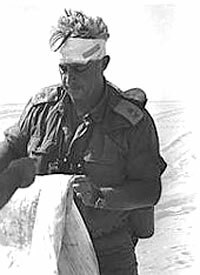 His crossing of the Suez Canal, against the orders of his superiors, changed the course of the 1973 Yom Kippur War. Afterwards, at home, crowds took to the streets chanting “Arik, King of Israel.” And in 1981, in defiance of the whole world, including the Reagan administration, he persuaded his fellow Israeli cabinet ministers to destroy Saddam Hussein’s nuclear reactor. Upon retiring from the army, he put equal vigor into pursuing political goals. He forged Israel’s disparate center-right parties into the Likud, the party that dominated Israeli political life for the better part of three decades, until Sharon himself broke it in two late last year. Serving in various political posts, he was reviled by Arab extremists but respected by leading Arab moderates, such as Egypt’s Anwar Sadat and Jordan’s King Hussein. After Israel’s 1982 Lebanon war, however, he found the most senior government posts closed to him. Sharon took the rap, as defense minister, for the reprisal massacres that Christian Arabs carried out against Muslim Arabs in Beirut in September of that year. Although a post-massacre inquiry cleared him of any direct wrongdoing, it was acknowledged that the killings had taken place while Israel had troops in Beirut and that Israel’s army could possibly have prevented them. Such a reversal wasn’t as strange as it might seem. Mr. Sharon had always been driven less by ideology than by a concern for Israel’s security, and security may well mean taking different measures at different times. Indeed, it had been Mr. Sharon who had forced through the traumatic withdrawal of Israeli citizens from Sinai more than two decades earlier. While Messrs. Hefez and Bloom naturally concentrate on Mr. Sharon’s public life, they explore his hardly less tumultuous personal life too: his complex relations with his parents; the death of his first wife in 1962 in a car accident; the death of his first son in 1967, at age 11, in an accident while playing with other children; his very close bond with his second wife (who was his first wife’s sister). We learn about the impoverished conditions in which he was raised in pre-state Israel – his mother tied strips of leather around her feet as she farmed swampland because she didn’t want to ruin her only pair of shoes – and about his later success in building up Israel’s biggest cattle farm in the spartan Negev desert. Mr. Sharon was very proud of his animals, insisting on being called from the ranch if a new calf, kid or lamb was born, even if, when he was prime minister, it meant interrupting him in a tense cabinet meeting. In the end, to the utter astonishment of Mr. Sharon’s many enemies, opinion polls voted him the most popular prime minister in Israel’s history. Messrs. Hefez and Bloom help to show why. There will no doubt be other accounts of Mr. Sharon’s life – his close friend, the journalist Uri Dan, is bringing one out later this month, and may well offer more personal insights into what made Sharon tick. But “Ariel Sharon: A Life” is as good a place as any to start for those wanting to know more about this colossus of our time. Compared to past international media coverage of Ariel Sharon, which on a number of occasions in recent years has gone beyond personal demonization to outright anti-Semitism, the reporting on Sharon since he suffered a massive stroke last week has been relatively benign. Sharon, the butcher, the bulldozer, the war criminal, the “successor of Hitler,” has suddenly been humanized in several usually hostile quarters, such as the BBC. But only up to a point. Even amid this improved coverage, as Sharon lies fighting for his life, many articles in the Western media have retailed untruths, almost in passing, as though they were incontrovertible historical facts: Sharon initiated the second intifada, Sharon ordered the Sabra and Shatila massacres, and so on. According to a Google search, there were over 24,000 articles published on Sharon in the 24 hours following his stroke last Wednesday night. But it was only four days later, in Monday’s Washington Post, that there was the first mention of Sharon’s protracted and successful libel battle in the 1980s against Time magazine for its inaccurate suggestion that he had encouraged the Sabra and Shatila massacres. Equally, there has been almost no reference to the fact that the Sabra and Shatila massacres were carried out by (Christian) Arabs against (Muslim) Arabs, in response to massacres by Muslims, and virtually no indication that the Palestinians themselves had carefully planned the 2000 intifada. And the jailed Palestinian terror leader Marwan Barghouti told the Palestinian paper, the Jerusalem Times (June 8, 2001): “The intifada did not start because of Sharon’s visit to Al-Aqsa. The intifada began because the Palestinians did not approve of the peace process in its previous form.” But now as then Western media are uninterested in passing such comments on to their readers. Most of the reporting has failed to supply any context – for example as to why Israeli troops had entered Lebanon in 1982. I have seen hardly any references to past moves Sharon made for peace, such as the 1982 dismantling of Yamit and 13 other settlements in the Sinai. There have also been some nasty headlines and cartoons. “He is the King Kong of massacres” ran the headline of a news report on Sharon on January 8 in The Observer, the Sunday affiliate of Britain’s Guardian newspaper, referring to the recently released remake of the 1933 movie classic. “Ariel Sharon, agent of perpetual war,” was the headline of an article in the relatively moderate Lebanese paper, the Daily Star, on January 7, 2006, by its editor-at-large and frequent guest on America’s NPR, Rami Khouri. On Friday, the entire front page of the (London) Independent carried a photo of Sharon with the words “Inside: Robert Fisk on Ariel Sharon.” The article, over 7000 words extracted from Fisk’s new book, was hardly about Sharon at all, and consisted almost entirely of Fisk’s claims about what happened at Sabra and Shatila. Unsurprisingly, Fisk made no mention of Sharon’s successful American court ruling against Time. Yet overall, the international coverage of Sharon since his stroke has been relatively kind. Who could have imagined, for example, that the New York Times – which for decades has blackened Sharon’s reputation – would run a comparatively complimentary editorial on him by Benny Morris? Who could have imagined that the home page of aljazeera.net would this week show Sharon sitting in a grandfatherly pose looking on as Hanukah candles were lit? I use the term “relatively kind” because it is important to recall what the coverage of Sharon was like until just a few weeks ago. He was not only reviled in the international media, but frequently portrayed in viciously anti-Semitic terms. A week earlier, El Pais, Spain’s equivalent of The New York Times, published a cartoon of an allegorical figure carrying a small rectangular-shaped black moustache, flying through the air towards Sharon’s upper lip. The caption read: “Clio, the muse of history, puts Hitler’s moustache on Ariel Sharon”. Hundreds of similar anti-Semitic motifs have been applied to Sharon in recent years. The Economist magazine compared him to Charles Dickens’s infamous anti-Semitic stereotype, Fagin. (An earlier edition of The Economist ran a blackened front cover with the words “Sharon’s Israel, the world’s worry.”) And grotesque cartoons of Sharon have continued to appear until as recently as six weeks ago in, for example, the Guardian. Now, by contrast, attitudes to Sharon are by and large restrained, even respectful. But we still have to wait and see whether journalists in the supposedly respectable world media have decided to rid themselves once and for all of the anti-Semitic overspill in their Israel coverage. It is much too early to tell.